This page indexes information on this website about crowns for broken-down teeth, as well as bridges and other treatments for replacing missing teeth. A crown (some people call it a “cap”) is used to restore a tooth that would otherwise be in danger of breaking. It covers and protects the entire tooth. Click here for information about crowns for front teeth. Click here for a general discussion of all types of crowns including porcelain crowns, whether for front teeth or back teeth. We have a separate page about the new CEREC crown that can be fitted in one appointment instead of two. For general information about dental crowns, click here. A dental bridge is used when there is a tooth missing. It usually involves putting a crown on each tooth on either side of the missing tooth, and then a false tooth or teeth is suspended between the crowns. An Encore® bridge is a special kind of bridge that is popular with some cosmetic dentists. It is made entirely of tooth-colored materials. A Maryland bridge is like an Encore® bridge but with a metal framework instead of a tooth-colored framework. This causes some esthetic problems. A dental implant is a tooth replacement that is surgically placed in the jawbone, and then a crown is placed over the implant. For replacing a front tooth, we recommend a cosmetic dental implant done by an expert cosmetic dentist. A removable appliance may also be used to replace a missing tooth. What does a temporary crown do? Should the Maryland bridge really be called the Halbauer bridge? 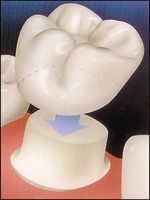 Does a root canal tooth need a crown always?